Creatives reflect on their design mentors. Courtesy of Katie Gong; Courtesy of Chelsea Neman Nassib. What made you pursue your career? Did you fall in love with numbers? Did you recognize your keen eye for business? Did you challenge yourself to tackle a new skill? Or did someone inspire you and guide you along the way? Often times that last component — a mentor — can truly be the final push to not only get you into your job, but also thrive within it. It can be one person, or a few along the way, but someone who gives you the drive to pursue your goals is one of the most incredible friends to have in your arsenal. Deciding to take on a career in design is no easy feat. Not only does it require skill and creativity, but it takes a lot of work to make a living and gain recognition in the space. So when we have spoken with many creatives in the space, they often point to an amazing mentor who helped lead them when they were starting out. In fact, the design community as a whole is an amazing group of friends who are constantly helping each other in their endeavors. To highlight the power of mentorship, we asked a few amazing women in the design space to talk about the people who made their careers possible. From colleagues to parents to friends, each individual truly made an impact in the lives of each of these creatives. If you want to learn about what it takes to gain a mentor and also get a peek into the career paths of the some of the most innovative ladies out there, take a peek ahead. Courtesy of Leanne Ford; Photographed by Genevieve Garruppo. 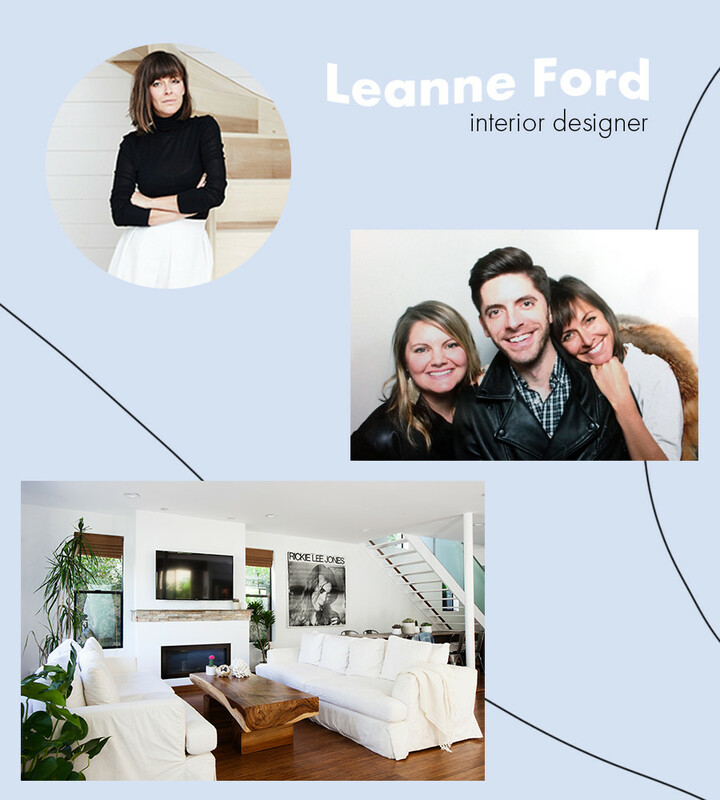 Leanne Ford is an interior designer who has designed some of our favorite homes out there. Known for her "white on white" signature aesthetic, the Pittsburg native is now hitting the silver screen with her brother in a new HGTV show Restored by the Fords. 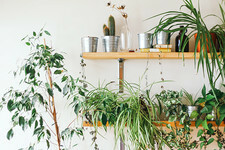 Lonny Mag: What made you initially fall in love with design? Leanne Ford: What I love about design is the FEELING you get when you are in a space that feels right to you. You just know when you are somewhere special and there is a special feeling in a space that draws in people and makes them feel good and alive and content and inspired. That’s my favorite part. LM: When did you start to consider it as a career? LF: Oh, I’m pretty sure I’m still surprised it even IS my career… when I realized it might be a potential career for me was when someone offered to pay me money to help them design their space! I had NO idea what to charge, or how to do it. But I remember thinking… oh this is happening! LM: Was there one particular mentor who helped you as you were starting your career? Who was that person and how did they help guide you along the way? LF: Dan Mazzarini and Amy Myers! My two dear friends from high school. They have both taken extremely different paths within the interiors field and they have both been very successful. They are the ones I called when someone asked me to design their home. They are the ones I call today when I have a business question in the world of design. 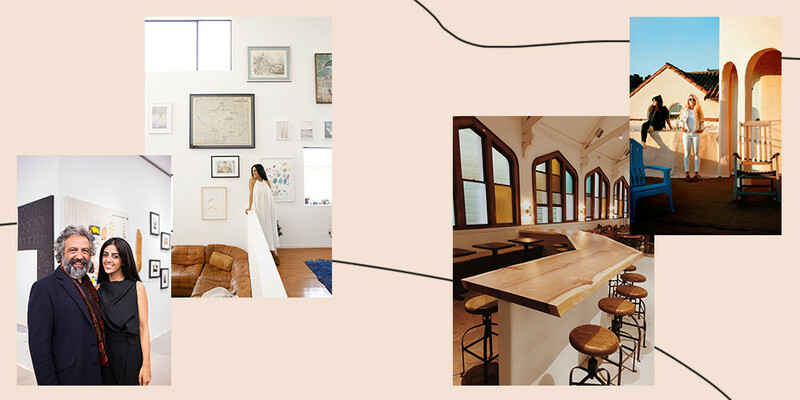 The first time someone asked me to design their home I called Dan and he talked me through the basics of what to do, how to charge, what to say, and how to present ideas… I feel like I went to the Dan Mazzarini School of Interior Design in about an hour! I will forever be indebted to him for taking the time to help an old friend. Dan and Amy are both so patient with their time and open with sharing their knowledge. I could never have done what I do now without them. LM: Have you turned towards your mentors continually as you started to gain success/still stay in touch? LF: Constantly. Poor friends… I am always calling to ask them how to handle this scenario or that. I am a “learn as I go” kind of girl. And I keep going. And I keep learning. LM: Do you think you have become a mentor for other people in the design world? LF: My favorite thing to hear is that others are inspired by my career and by my ideas. The fact that someone may be following their bliss because they were inspired seeing me doing it is nothing short of magic. It an honor. That’s the only way to describe it. LM: What does that responsibility feel like? LM: Is there any advice you would like to pass on to anyone seeking a career in design? Start decorating! Take pictures of your work. Redecorate. Move the same furniture around. Take more pictures. Post them. Get your friends to let you come over and move their furniture around. Take pictures. The word will spread and before you know it people will be calling YOU. That’s when you better call Dan and ask him what’s next. Photographed by Brett Walker; Courtesy of Katie Gong. 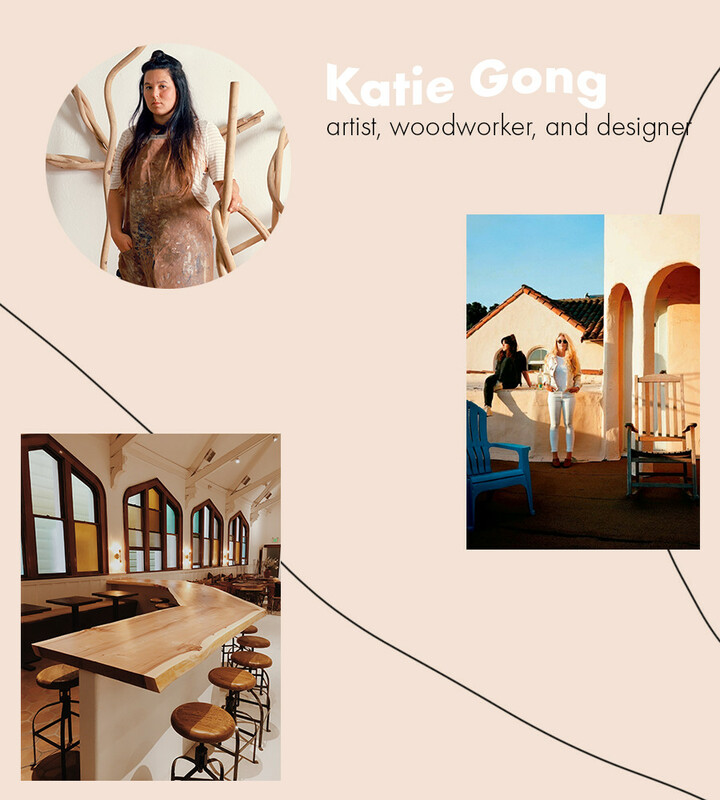 An artist, woodworker, and designer, Katie Gong combines function and form to create works that have taken notice of the Bay Area and national stage. 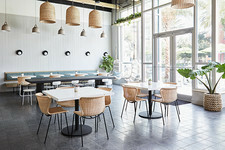 From unique knots to custom-made furniture, Gong is proving the flexibility and versatility of wood in the design space. Katie Gong: From a very young age I was fascinated design, particularly how wood pieces were made and fit together. My grandfather was a carpenter and made many pieces for my grandparents' house. I used to love to sit under his tables and look at how he had made it. This began my obsession with taking things apart to see how to put them back together. KG: I had a few jobs after I left college. Like many, I had a lot of interests and had a hard time picking just one passion. These jobs were pretty scattered. I did everything from measuring trees for renderings for a landscape architect, to retouching images for advertising, to website building and maintaining, to staging for an interior designer. I finally landed at Anthropologie, as a Display Coordinator. There, I did many projects that were all centered around sculpture, building, design, and woodworking. After five years, I made a decision that I could keep making my art under the umbrella of Anthropologie, or I could go out on my own. I lined up a couple of freelance gigs and took a leap. That was back in 2012. KG: I have always thought of my father as my mentor. He had a general construction small business throughout my whole childhood. We always made things growing up. My father made my sister and I a whole treehouse structure complete with pipe and flange monkey bars and horse see-saws that were carved with a grinder. He still is always tinkering and building things. He's one major inspiration of mine. He always taught me to use what you got and to problem solve and to make things work. My partner, Brett Walker, is also another constant strength that I have in my life. He is an artist, as well and really supports my path and journey. It is such a blessing to have a partner that not only understands the sacrifice but is on the trail with me. We make a lot of art together, which is really fun and rewarding. Professionally, I met Aleksandra Zee at Anthropologie, and she has really been a source of inspiration and camaraderie as we have both grown into our crafts. We met at work but didn't become super close until after we both had left. After that we worked on many projects together and have shared numerous studios together. She really pushes me and is a constant source of assistance and inspiration. KM: Have you turned towards your mentors continually as you started to gain success and still stay in touch? KG: Yes. I am only able to grow and achieve success because these humans have been in my court since day one. Think I talk to one or all three of these people at least once a day. LM: Do you think you have become a mentor for other people in the design world? If so, what does that responsibility feel like? KG: I had a few interns when I was at Anthropologie that are now amazing artists (Yeah Alice Wiess! ), which makes me so proud. The responsibility is great, but totally rewarding. KG: Just go for it. Start small, but jump in feet first. That's really the best way. See what things you like and what things you don't. Experiment and enjoy the ride! Courtesy of Chelsea Neman Nassib. Heard of the amazing site Tappan Collective where you can find and buy unique curated art? Well it's the brainchild of co-founder Chelsea Neman Nassib. 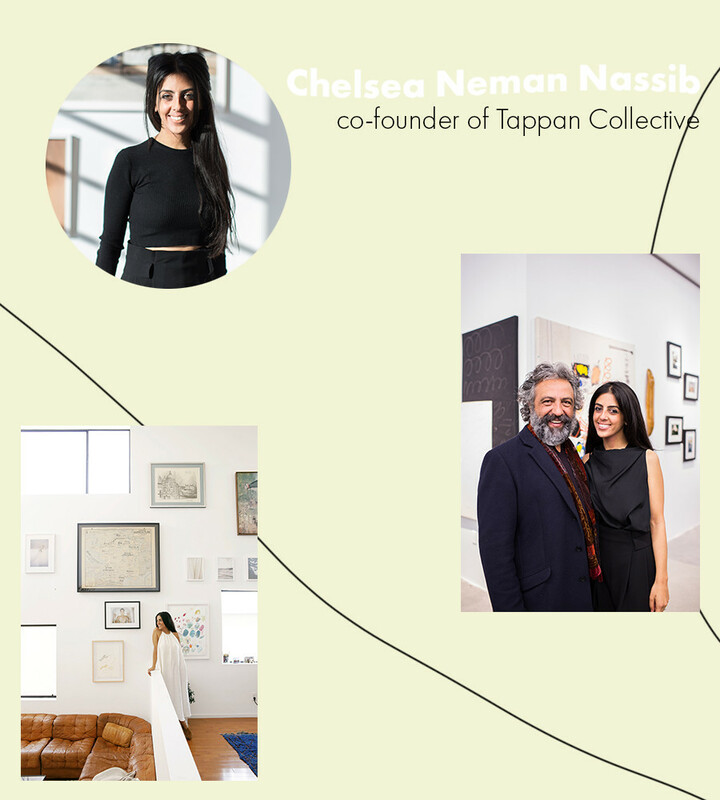 With a goal of introducing emerging artists to new and seasoned collectors across the world, Nassib has created an amazing platform for new art to find a home. Lonny Mag: What made you initially fall in love with art? Chelsea Neman Nassib: Art has always been my great passion. I was constantly drawing and painting from a young age, so it was a very natural progression for my career to head in that direction. When I imagined my future, it always seemed to be rooted in the art space — it's where I have feel most myself. CNN: When I completed my MFA at the University of Michigan, I quickly realized that there was a gaping hole in the traditional art world for emerging artists. My peers and I were thrust into the world post-graduation with little to no infrastructure to assist us to build careers. So I decided to be a part of the solution and create an online space to support the artists of the future. Tappan connects artists to their collectors, but our mission is really to bring art back into the common conversation and make the art world more accessible to everyone. CNN: Without a doubt, my Dad has been an amazing mentor. As an entrepreneur himself, he has been there every step of the way to help guide me with everything from accounting, to website design, to HR. No matter what challenges I face, he is always encouraging me to approach them with positivity. Looking for the silver lining makes it so much easier to stay solution focused and move through the inevitable tough moments of running a business. LM: Have you turned towards your mentor continually as you started to gain success? CNN: Yes, he is definitely still my go-to person! LM: Is there any advice you would like to pass on to anyone seeking a career in art? CNN: Don't be afraid to make mistakes! Everyone makes them all the time and what it important is to recognize the mistake, fix it, and keep going. Don't be discouraged if things don't go exactly as you planned, because there might be something better right around the corner! You've got to keep going because you know that this is your purpose and you're going to do something great.